Learning German can be more than studying grammar and memorising vocabulary. 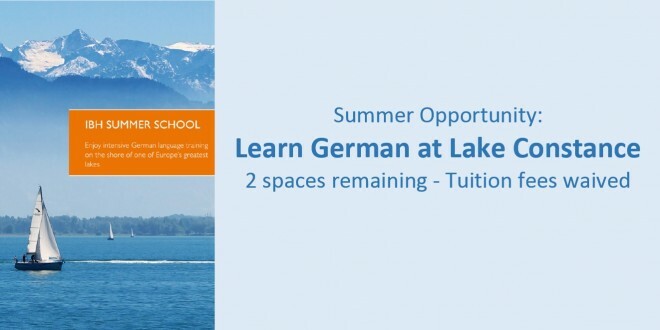 It can also mean discovering the culture of German-speaking countries, spending the summer in the tri-border region of Germany’s biggest lake in the heart of Europe, making international friends and gaining ECTS credits for it! The Summer School of the International University of Lake Constance (IBH) consists of a 4-week intensive German language course accompanied by an attractive cultural program… great fun included! The IBH Summer School is hosted by the University of Konstanz, known for being a modern, small and highly awarded university. 2 spaces remaining with waived tuition fees. Please contact the us if you are interested. UPDATE March 30: The two spots with waived tuition fees are taken. Please feel free to apply independently at the website above and get in touch with the Centre for International Experience.